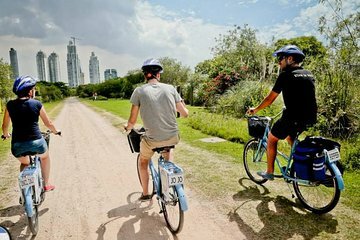 Pedal through the historical heart of Buenos Aires on this 5-hour bike tour. Follow your cycling guide through the historic neighborhoods of La Boca and San Telmo, getting a feel for the roots of Buenos Aires. Continue to Puerto Madero, a recently revitalized area that is also home to the city's Ecological Reserve. Make many stops along the way to rest and take photos. Stop for a traditional parilla lunch and then head toward Plaza de Mayo, the site of many important historical events in Argentina's history. Lunch and use of bicycle and helmet are included. Marcelo was an excellent guide with lots of interesting background information, historical, political, and contemporary culture, during a modest bike ride around the San Telmo area, which managed to include many tourist highlights Caminito, Puenta de la Mujer, Puerto Madera among others. To add real Argentine flavor to the tour he includes a tailgate party style Fernet com Coke at the stadium meeting park and mate in the park made and served in the traditional way. He is fully fluent in English. Caveats: this is just heart of the city as it says and it does not explore further away. Lunch is a local Argentine experience and not gourmet may be good or bad depending on your perspective. The bicycles are single speed. A great way to see some great sights in BA. About 80 percent of the ride is on dedicated bike lanes. Bikes are good and terrain is flat. Our tour guide Santiago was very friendly and knowledgeable. We thoroughly enjoyed our bike tour with Kaylee and Pedro! They were also amazingly flexible, agreeing to wait for us for over a half hour as we were unavoidably delayed...Kaylee is very knowledgable about Argentinian history and gave us a lot of information about the various sites we visited. We stopped for a yummy lunch at a local food truck - delicious! Kaylee also followed up by sending us various articles of interest, as well as local restaurant recommendations. As Kaylee is from California, her English was impeccable. Overall, we all had a WONDERFUL time. The ONLY negative is that the condition of the bikes, on the whole, was not great - particularly the brakes...Nevertheless, we all returned safely after riding around Buenos Aires for the day!! Rodrigo was incredible, so pleasant and knowledgeable. The perfect way to visit B.A. and absorb the soul and passion. Easy ride good for everyone, they gave us also water and ponchos for the rain. Amazing! Rodrigo was warm and funny, and very informative. His English was excellent, and he answered every question as if he had never heard it before, which is a great talent! The bike ride was flat, but far enough to feel like I had gotten a little exercise, and the lunch from the food truck was my best meal in Buenos Aires! Santiago was an excellent guide. Great way to see the city. The best way to know Buenos Aires. This bike tour was a great way to see the heart of the city. The bikes allowed us to cover a lot of ground in a short period of time. Since, Buenos Aires is really flat, it was not hard at all. There are bike lanes almost everywhere, but in a few places, we had to ride in the busy streets. For this reason, I would not recommend this tour for small children. Our teenagers did well. Our guide, Gol, was very knowledgable about the history of Buenos Aires and skillfully guided us through several neighborhoods. Lunch at Puerto Madeo was delicious. All in all, it was a great day!